The swatches of the Anastasia glow kit are very vibrant. 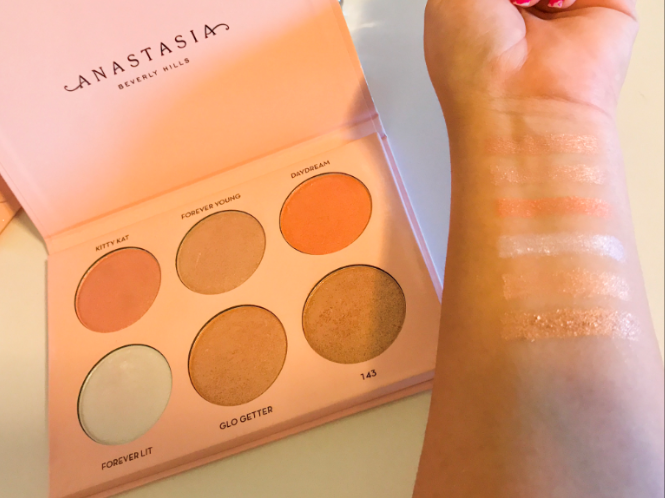 When I first heard about Nicole Guerriero and Anastasia Beverly Hills’ collaboration on a glow kit palette, I immediately knew that my inner make-up hoarder had to have it. I wasn’t planning on purchasing it right away on its launch day, but when Sephora announced that they would have a 48-hour pre-sale on their app two weeks before the palette’s release, I gave in. I’ve been following Guerriero on YouTube for five years now. She was the first YouTube beauty guru that I subscribed to and in my opinion, one of the most dedicated to her channel. Highlighters made a huge influence in the beauty world last year, and this year highlighting certain areas of your face is still continuing to be a hot trend. The palette finally arrived about a week later and I was so excited to take a look at it. My first impression on the palette was its packaging. I thought it was an instant eye-catcher. It has a light pink shade and tiny Guerriero’s glow kit shines specs of shimmer all over the packaging. The brand’s name, Anastasia Beverly Hills, is colored in black at the top center and Guerriero’s name is written in big holographic letters at the bottom left. When the palette is placed underneath light, the specs of shimmer and holographic letters give off a really nice sheen. Another thing that I loved about the packaging is that the lid has two tiny magnets at the top that stick together when closing the lid. I really liked this because it ensures that the palette will be secured once you close it. I’ve had other palettes that don’t have a feature such as this one and the product inside always ends up getting destroyed or falling out. It is also a very light-weight palette and its size is slightly wider than my iPhone 7 plus. Therefore, I can confirm that this palette is good for on the go. When you open the palette, you get six beautifully colored highlighters that I’m confident are bright enough to blind extraterrestrial creatures thousands of lightyears away. Each highlight ing pan is about the size of a Gatorade bottle cap, which I think is a pretty good size for six. Upon first trying on the highlighters, I immediately noticed how soft to the touch they are. Not only that, but one simple swipe with my finger picked up a lot of the product, making them highly pigmented. I personally like make-up products that have a lot of pigmentation because that means that I can use less product and extend the life of the product. I’m the type of person that looks at details such as this one, especially when I’m going to spend a few extra bucks. The highlighter colors have the same undertones and come in pink, golden, and peachy colors. One shade that speaks to me on a personal level, is the shade “Forever Lit” because it is like no other I’ve seen before, a white, iridescent shade. The glow kit palette retails at Sephora for forty dollars and will be available for in-store purchase on March 17. I have heard several people mention that this is a limited edition palette and I would highly recommend purchasing one.